Confessions of a Hungry Woman: Babylonstoren & Babel. Where words fail. The name Babel has always conjured up images of chaos and confusion. Or at least that is what it has done for me. Blame it on graphic Sunday school sermons on the Tower of Babel or my own overactive imagination. But no more. For I have visited Babel. And have discovered it to be a place of serene splendour and (seemingly) simple sophistication. I am to be honest, quite at a loss for words when it comes to writing about this place. Without any false modestly, I really don't think I could do it justice. Babylonstoren in Franchhoek is the private farm of media mogul Koos Bekker and his accomplished and extremely stylish wife Karen Roos (who up until a year or so ago was the editor of Elle Deco). A 200 hectare farm which also happens to have one of the best preserved farm yards in the Cape Dutch tradition and a manor house dating back to 1777. Today, it is a showcase of the style and heritage of which South Africans can be so proud. Visitors, no matter how sophisticated and worldweary/jaded they may be, will be entranced and amazed by what they experience on this working farm. Karen Roos, credits her husband for it all, and he apparently, says that all credit should go to her. But together they have preserved the past and pushed this example of South African hospitality to a whole new level. Am I gushing? If I am, forgive me, but go and visit you will do so too. There are cottages in which guests can stay, furnished in shades of white and neutral tones, where each and every carefully selected piece of furniture is either a modern master or of natural fibre. Modern bookshelves are laden with books that have clearly been chosen by someone who actually reads. And the bathrooms are indulgently over the top. Think space space space, achingly beautiful white and a hint of, could it be, Philippe Starck? There is also a garden, consisting mostly of fruit and vegetables that is probably inspired by the mythical grandeur of the hanging gardens of Babylon. 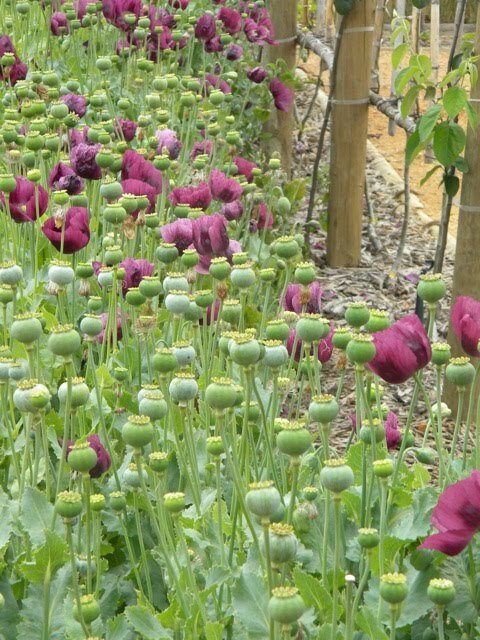 Imagine a prickly pear maze, clivia-lined stream and the presence of 100 snail-harvesting ducks. But here the produce is meant to be picked, eaten and enjoyed in an unpretentious, earthy manner. 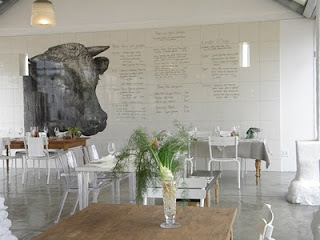 As it is in the farm's restaurant Babel, housed in the old disused kraal. 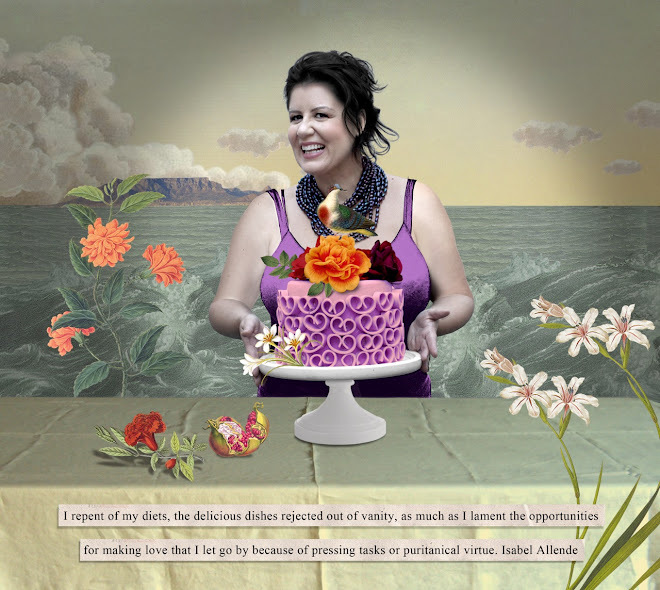 Here Maranda Engelbrecht (ex-Manna) - celebrated food stylist-consultant-and-guru has created a menu that is both awe-inspiringly inspirational, yet at the same time comforting. 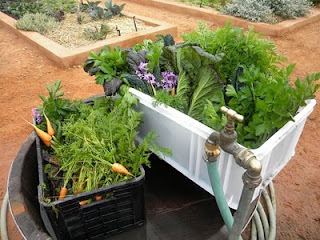 Dishes, written on the 'bull board' will change both seasonally and daily, depending on what the garden offers. For our lunch, our starters were platters of seasonal ingredients from the garden, designed according to colour; Green, Red and Yellow. 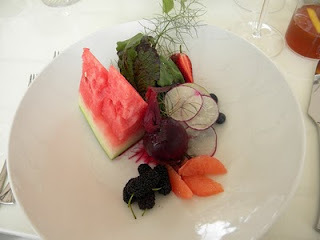 I loved the red which consisted of watermelon, strawberies, beetroot, radishes and mulberrries. For mains we ate from a selection of generously laden platters; salmon with granadilla and creme fraiche served with lightly stewed whole guavas and artichokes, sticky pork belly served with kumquat preserves and rib-eye on the bone served with mushrooms and two sorts of rustically cut salted potatoes. Deliciously robust food, artfully and elegantly served, packing a huge flavour punch. Deserts are divided into Sweet, Savoury of Sour.... Here Maranda's avant-garde style comes into play with a gorgonzola creme brulee that defies description. The white space of Babel is in itself a work of art, an assortment of elegant tables and chairs, crystal, and in the centre of the restaurant is the old stone trough now white, as is the rest of the restaurant, and filled with full-blown garden roses enticing visitors to wash their hands before dining. The glassware, plates and cutlery are modern, but the teacups and coffee cups are a delightfully colourful assortment of old elegant fragile pieces. The staff - all of them, from gardeners, to waiters, to those in housekeeping ( yes, the gushing again) are exceptionally well-trained, but also seem to have friendliness that cannot be forced or taught. 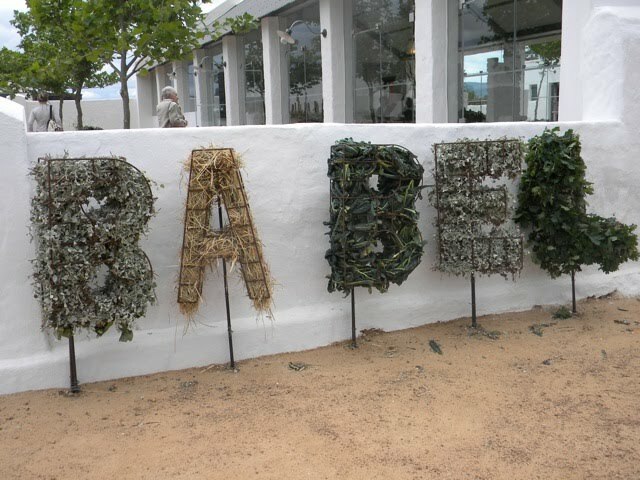 They seem genuinely please and proud to be part of Babylonstoren. They believe it to be special too. And there is something magical about a place in which no expense has been spared, that is achingly elegant but also very real at the same time. A place where real change happens. The Babylonstoren Trust is already changing the lives within their community. It all begins and ends with respect. And somewhere in between is the welfare of the people, education, nutrition, a choir, hope and love. Think this is just THE most beautiful place and cannot wait for my next trip to my mother country to go and visit! Thanks for sharing!! What a magnificent description..it seems your words are totally on par with the place. I sense the experience of being there just by reading this post. Thank you indeed!! A fantastic place. 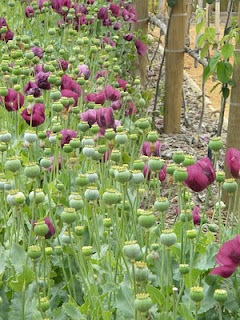 Those poppy seedpods are so beautiful. Just wrote about our visit this week.